The culmination of four years' worth of Marvel superhero movies (Iron Man I and II, Incredible Hulk, Thor and Captain America), The Avengers has already smashed the $1 billion barrier at the box office. However, its success is very much deserved: the film is witty, exciting and fast moving as all the best blockbusters should be. Director and co-writer Joss Whedon draws on his experience with ensemble casts (Buffy the Vampire Slayer) and ensures that each respective hero has their chance in the sun. When the mysterious cube the Tesseract allows exiled Norse God Loki (Tom Hiddleston) to pass into our world, SHIELD agent Nick Fury (Samuel L Jackson) realises there's only one way to stop him. Thus begins a daring worldwide effort to recruit a disparate band of heroes to prevent the annihilation of Earth: Tony Stark aka Iron Man (Robert Downey Jr), Steve Rogers/Captain America (Chris Evans), Bruce Banner/The Hulk (Mark Ruffalo) and Thor (Chris Hemsworth). They also have help from Black Widow (Scarlett Johansson) – but controlling all these vast egos will likely prove the trickiest task. 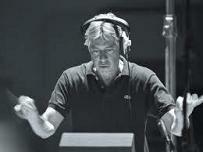 Contributing his second score to the Marvel universe is Alan Silvestri, who made a terrific comeback in 2011 with his music for Captain America: the First Avenger. That score was a breath of fresh air in contrast to its contemporaries such as James Newton Howard's Green Lantern, which seemed to view big, bombastic themes as outdated. Silvestri then came along with a superhero score that sounded heroic – a glib observation but his score was one of the few that embraced the patriotic, over-the-top conceits of its central character. 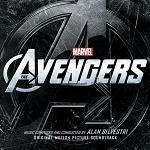 There was a degree of speculation as to how Silvestri would approach The Avengers: with so much material to draw on in the form of the previous Marvel films, would he reference the likes of Patrick Doyle's score for Thor whilst giving precedence to his own musical voice, or would he stake out completely fresh territory? In the end, Silvestri went for the latter option, placing emphasis on a brand new central theme for the Avengers group themselves whilst paying lip service to the multitude of characters with his own array of motifs. To put it bluntly, the score for The Avengers lacks the sense of surprise that greeted the Captain America soundtrack, but that shouldn't lead the listener to underestimate the score, or the variety of ideas circulating within it. Likewise, the central theme for the Avengers Initiative isn't as raucously entertaining as the Captain America March but its brassy tones and choppy strings still brim with terrific, flag-waving bravura. In fact, the construction of the theme is more complex than it appears, and the burgeoning sense of heroism is teased out over the duration of the soundtrack, rather than hitting the listener over the head from the start. "Arrival" introduces the moody string motif for the Tesseract from Captain America before the "Assemble" part of the main theme (essentially its first half) makes its first dynamic appearance on powerful, driving strings. This effectively prepares the listener, informing them of the recruitment mission to come. "Doors Open from Both Sides" slips into threatening territory, introducing the menacing motif for the baddie, Loki. The familiar Silvestri action style then takes over in "Tunnel Chase", placing Loki's theme in an action context with timpani hits, xylophone strikes and frantic orchestral arrangements that follow on-screen events in Mickey Mouse fashion. The track then culminates in the first full blown brass arrangement of the heroic part of the Avengers theme, and wonderful it is. In deference to Ramin Djawadi's score for the first Iron Man, Silvestri then introduces a harsher electronic edge to the track, "Stark Goes Green"; there's also some attractive romantic material in a low key vein on piano. Meanwhile, the "Helicarrier", our heroes' floating, invisible base, gets a fantastic surging theme all of its own, drawing on the principal ingredients of the Avengers theme and indicating its importance to the survival of the central characters. "Subjugation" re-introduces the dark material for Loki (even including a reference to Jerry Goldsmith's Poltergeist 10 seconds into the track). A hallmark of Silvestri's style is the little touches he includes in underscore tracks such as these: the repetitious banging anvils heard in this track and the following "Don't Take My Stuff" represent the clash of weapons as the heroes and villains wage war, and a wavering violin motif adds a note of tender humanism, albeit briefly. The Captain America theme makes a welcome re-appearance here too. "Red Ledger" calms things down by introducing the sultry woodwind theme for Black Widow, harbouring Slavic undertones that hint at the character's background. This then competes with the more insidious material representing Loki. "Assault" once again ushers in more frantic action as the Avengers' base is attacked; here, Silvestri cleverly indicates how the characters begin to work together by tying the disparate motifs together, particularly the themes for Iron Man and Captain America, who form a crucial double act in the scene in question. The Avengers theme itself is again teased out but doesn't receive a full blown rendition. Instead, the music quietens down again in "They Called It", allowing a period of reflection after the previous aural onslaught. However, this is just a prelude to the final battle. "Performance Issues" opens with a superb choral rendition of the main Avengers theme, although it's sadly brief and the only vocal injection in the score. What is effectively a mammoth, 20 minute action set piece then kicks off comprising five tracks: "Seeing Not Believing", "Assemble", "I Got a Ride", "A Little Help" and "One Way Trip". This is where Silvestri finally brings the multitude of musical ideas together and finally lets the Avengers theme off the leash properly, as they band together to protect the Earth – the in your-face heroic statements in "Assemble" and "One Way Trip" are magnificent. Elsewhere, bold horn arrangements clash with shrill, dissonant strings and anvil strikes as Loki attempts to bring his plan to fruition, and the relentless percussive effects (especially the xylophone runs) will be familiar to many Silvestri fans. Although the music appears to be an overwhelming assault, there are multitudes of ideas circulating within to give it a sense of structure. The way Black Widow's theme is adopted as an action motif in "I Got a Ride" for example is terrific. Character ideas that maybe weren't as prominent as before also make their stand: the epic collision between brass and strings representing the battle between half-brothers Thor and Loki for instance. "A Promise" starts with a beautiful acoustic guitar/cello wash, the perfect come down after the earlier action, before Silvestri puts the main Avengers theme through a brilliant set of variations, building it gradually right up to the end of the track before the end credits blowout. The climactic cue "Avengers" presents the theme in its most complete form (both the string-led assemble half and the brassy heroic half) and brilliant it is, even transferring the piece onto a cheesy drum machine for a few bars before resolving it with the might of the full orchestra. The presence of the drum machine indicates Silvestri's level of awareness: he understands exactly what kind of over-the-top film he's scoring and isn't afraid to draw attention to that in the music, but he never undermines the power of the score. It's tempting to see the score for The Avengers as a wall of noise and indeed on the first listen, it does seem to come running at you. More than a lot of scores, it's very important to hear it in context: once it's clear how the music functions on a very scene specific basis within the film itself, it consequently makes much more sense away from it. Silvestri's music hits a lot of specific cue points during each given moment within the movie, and on its own, it appears to leap around haphazardly. However, this shouldn't deceive the listener into thinking it's noisy for the sake of it. The composer's orchestrations are as complex as ever and the way in which he builds his central theme gradually over the score is very impressive. 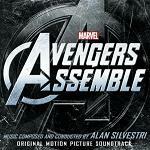 Although many listeners will no doubt have expected Silvestri to directly reference the scores for past Marvel movies, this would likely have overwhelmed the movie and bogged it down in a surplus of themes. Instead Silvestri streamlines things, deploying his own array of ideas, both new and pre-existing, that expertly circulate around each other in the manner of the characters on-screen, before they are united together through the power of the Avengers theme itself. It may not have the freshness of Silvestri's work on Captain America but the fact that Joss Whedon signed a composer with a strong sense of melody and rhythm is a very positive sign indeed. One important thing to note about The Avengers score is the download release is incomplete, and lacks 10 minutes worth of more striking material, including robust statements of the main theme and interesting percussive material for Black Widow. Those who wish to seek out a complete release of the score need to purchase the Intrada CD at Amazon.co.uk and Amazon.com; otherwise, the score download is a comprehensive representation of the music in the film and is available from these links at Amazon.co.uk and Amazon.com.